Wednesday is here again! Boy, do they fly by! You’re in for a treat this week at Freshly Made Sketches. The super fabulous Jennifer Timko is our hostess this week and she has a versatile sketch for us. When I first saw this sketch, I immediately thought of Project Life cards. That could be because they were sitting on my desk at the time, but I think the rounded corners and the size of them are just perfect for this sketch. I love how you can use them for more than just scrapbooking. I needed another graduation card, so I punched out some little banners with the Banner punch and added some number stickers that come with the Everyday Adventure Project Life Accessory Pack. They fit on these little banners perfectly. I added some sequins to “tie” the banners together. 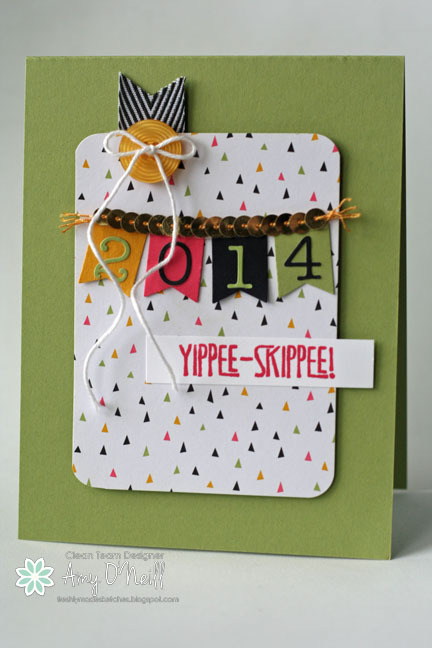 The “Yippee-Skippee” is from the Yippee-Skippee stamp set, and is really the only stamping on this card. The colors are Pear Pizzazz, Crushed Curry, Strawberry Slush, and Basic Black. You should jump on over to the Freshly Made Sketches site for some inspiration from the design team. There is such a fabulous variety from the team this week, which shows just how versatile this sketch is and just how talented these ladies truly are. 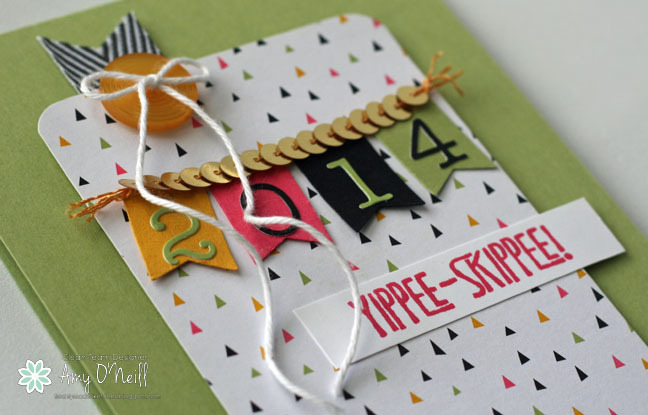 This entry was posted in Freshly Made Sketches Challenge, Project Life, Yippee-Skippee!. Bookmark the permalink. Super cute use of the PL card! Love the embellishing!! Amy, I really enjoy your blog – you make it look so easy! I love how you are able to put everything together and come out with a fabulous card. Thanks for the inspiration!! This is so darn cute! I love that PL stuff and am afrid I am gagging I use most of it on my cards! Lol……who wrote that last comment…….that should say……I am afraid I am going to use most of it on my cards……..no gagging anywhere! Ok, Linda’s comment was hilarious…and your card FABULOUS, Amy. I agree with Ruth that you make cards look so easy but I know it takes time to put together such a creative card. So enjoy your blog, Amy. TFS with us. No gagging from me, Amy 🙂 This is a fab card – love the little banner and the colors are great! I love Linda!!!! That comment was the best!!! Great card Amy! Love how you’ve used the project life card! I need to start incorporating all the left over PL cards I have into my work!!! Great colours and I love those sweet banners!!! The sequins are the icing on the cake!!! How funny! I’m sitting here first thing in the morning while everyone is asleep laughing out loud! Your card is amazing (as usual) Amy! Love the banner for this sketch and I LOVE that thicker twine! I can’t stop giggling every time I read that! I know that Linda won’t admit to it, but I’m gagging with excitement over this card! The flags, the confetti, the sentiment – it’s all good! No gagging here! This card is AMAZING! I love how you used components from PL for this masterpiece. The details are perfect. LOVE this card! Amy,what a fabulous card!!! The banner with the numbers is awesome! And great idea to use a PL card! !